the-noh.com : Introducing the world of Noh : What is “Noh”? | Home | World of Noh | What is “Noh”? Stemming from the popular entertainments in Nara during the Heian period (794-1185), in conjunction with various ritual offering dances, noh was created during the latter half of the Kamakura period (1185-1333) and the early part of the Muromachi period 1336-1573. While under the patronage of the shōgunate and high-ranking noblemen, noh also came under the influence of some of the Muromachi period’s popular arts including Zen Buddhism and ink painting. Noh’s founder, Zeami, is one of the most important historical figures in Japanese theatre. A collection of his treatises on noh, “Fūshi Kaden,” was published some 200 years before Shakespeare’s theatrical debut. Even today, his treatises affect the lives of Japanese in unexpected ways. 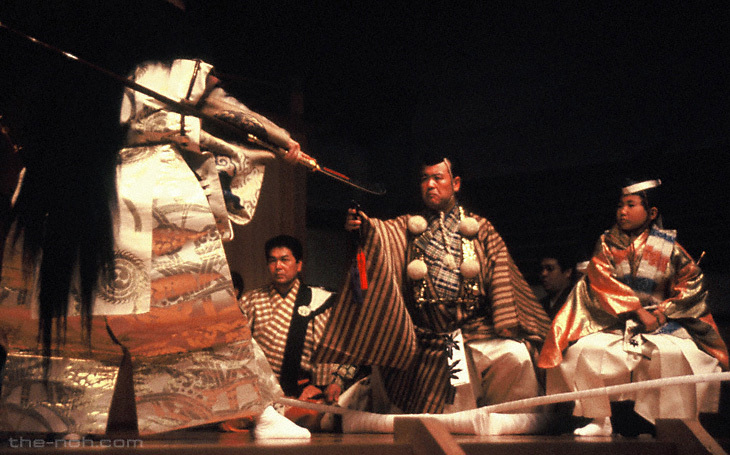 One of noh’s characteristics is that it is “simple.” Unlike Kabuki or modern theatre, the stage for noh does not contain large set pieces or many props. In addition, the audience is not cut off from the open stage by a curtain. In the singing of noh, the leadership responsibilities on stage are shared between the chorus and the musicians. They, along with the performers, all appear on the stage together. The music, like the movement, is stripped down to create a sparse, concentrated atmosphere wherein the vocal and instruments can better express through nuance. From the Meiji Period (1868-1912), noh was widely introduced overseas to many thinkers and theatre artists, and their work was greatly influenced by what they saw and heard. From the 1950’s the establishment of performances of noh outside of Japan increased its visibility. Due to the high regard in which the international community came to think of noh, it was designated an Intangible Cultural Heritage.